BY PATRICK VEREL ON MARCH 22, 2019 for Fordham UNIVERSITY NEWS. A 963-kilowatt solar panel array was recently installed atop the five-story parking garage on Fordham’s Rose Hill campus, and is expected to be operational in April, thus dramatically increasing the University’s embrace of renewable energy. In 2010, a 25 kilowatt solar array was installed on the roof of the William D. Walsh Family Library, Rose Hill’s most energy-intensive building. The array, which comprises 2,790 individual solar panels, is the second to be installed at Rose Hill, and will generate electricity for use throughout the campus. In 2010, 84 panels were installed on the roof of William D. Walsh Family Library; they generate 25 kilowatts for the library, Rose Hill’s most energy-intensive building. The University has also begun drawing renewable energy from off-site sources, including the largest solar system in New York City to date. In July, Fordham signed a 20-year agreement with the solar developer EnterSolar to purchase electricity generated at a 10-acre, 9,000 solar panel installation just east of the Arthur Kill waterway in Staten Island. It will generate up to 2.6 megawatts of solar power annually, which will be credited to Fordham’s energy usage. Marco A. Valera, vice president of facilities management and sustainability at Fordham, said that the new power sources can provide over 20 percent of the total electric consumption at the university when operating at maximum production. 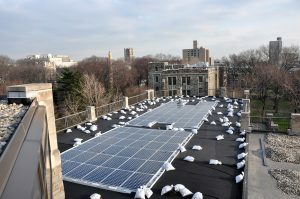 It makes Fordham the largest consumer of locally installed solar capacity of any college in New York City, and goes a long way toward cutting the University’s carbon output. “This is a terrific initiative for the University, as we achieve budget savings over the term of 20-year contract at the same time that we significantly reduce our greenhouse gas emission profile,” he said. The array at Rose Hill will also benefit the community at large, as it will provide energy to subscribers of Con Edison’s Community Distributed Generation program, also known as Community Solar. Just as Fordham is leasing the array in Staten Island, so will those subscribers lease a percentage of the energy generated at Rose Hill. Julie Milea, (FCRH ’17), EnterSolar’s engineer for the Rose Hill project, added that solar power is not only cost-effective, but an efficient use of green or renewable power. It draws the most power during peak daylight hours, exactly when there is the most electric use in buildings. Top Photo: The solar array on top of the garage is comprised of 2,790 individual solar panels and is the second one to be installed on the Rose Hill campus.